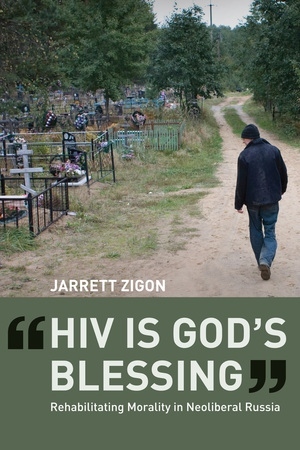 This provocative study examines the role of today’s Russian Orthodox Church in the treatment of HIV/AIDS. Russia has one of the fastest-growing rates of HIV infection in the world—80 percent from intravenous drug use—and the Church remains its only resource for fighting these diseases. Jarrett Zigon takes the reader into a Church-run treatment center where, along with self-transformational and religious approaches, he explores broader anthropological questions—of morality, ethics, what constitutes a “normal” life, and who defines it as such. Zigon argues that this rare Russian partnership between sacred and political power carries unintended consequences: even as the Church condemns the influence of globalization as the root of the problem it seeks to combat, its programs are cultivating citizen-subjects ready for self-governance and responsibility, and better attuned to a world the Church ultimately opposes. Jarrett Zigon is Assistant Professor of Anthropology at the University of Amsterdam. He is the author of Morality: An Anthropological Perspective and Making the New Post-Soviet Person: Moral Experience in Contemporary Moscow.